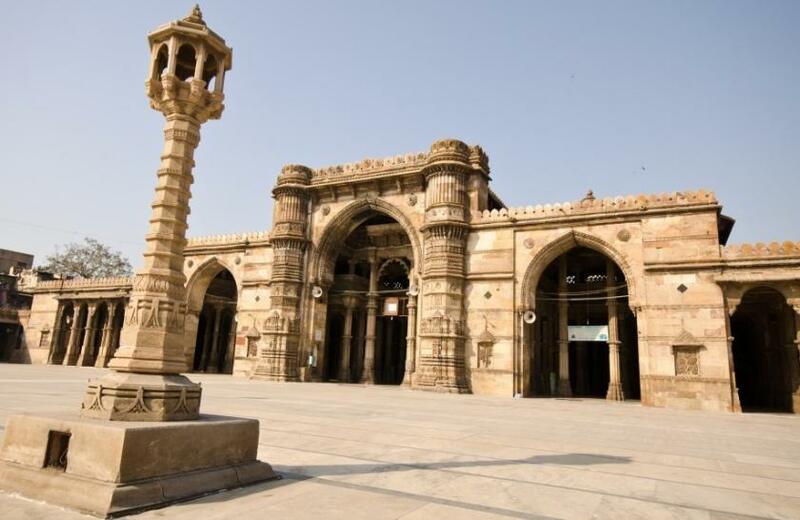 Jama Masjid built during 1424 CE in Ahmedabad (originally Karnavati) by Ahmed Shah I is originally hindu temple of Goddess Bhadrakali. 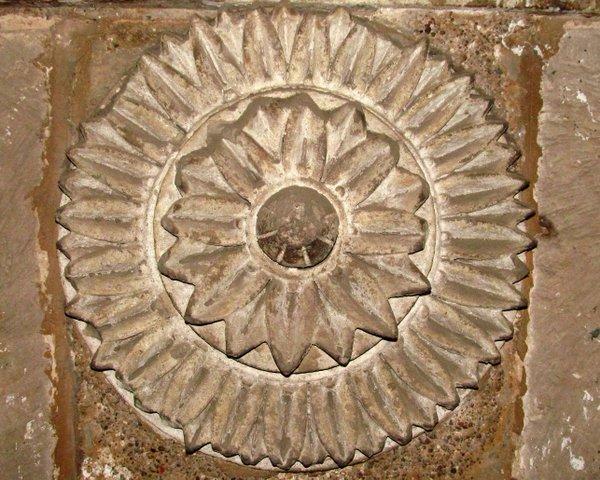 Ahmedabad city’s original namee were Bhadra, Karnavati, Rajnagar and Asaval in different eras. 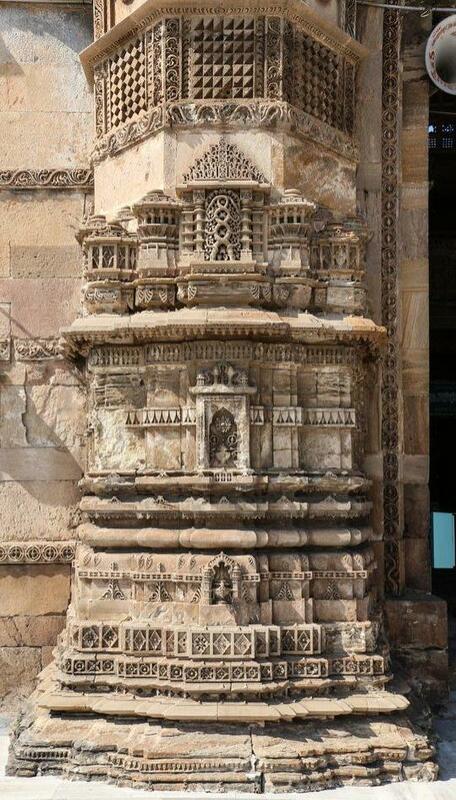 The name Bhadra was after the Goddess, whose temple was built by Rajput Parmar kings of Malwa (Rajasthan), who ruled this area in between 9th-14th centuries. Filigree carvings of flower and Paisley motifs, lotus flowers and creepers, mandalas, elephants, coiled serpents representing the kundalini, celestial dancers and bells are found carved on the 100 odd surviving pillars that line the temple complex. If this was originally supposed to be a mosque built with a large hall for mass prayers, then what would be the purpose of having so many pillars in between ? Most of the pillars are carved in typical hindu temple style. Mosques have large halls or open places where many can offer namaz (prayer) at a time. 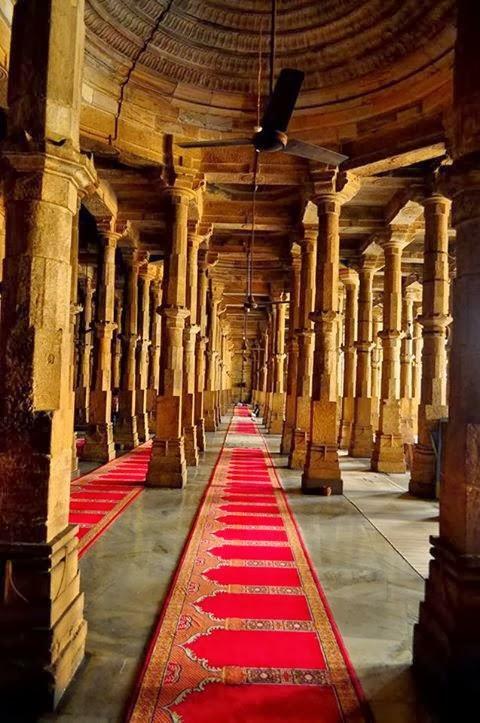 Wouldn’t the pillars cause an obstruction while offering Namaz ? Many hindu temple pillars are usually carved with stories from the Puranas, Vedas and Itihasas like Ramayana and Mahabharata. The original Bhadra fort still exists in distorted shape. Jama Mosque is situated outside Bhadra Fort area, along the south side of the road extending from Teen Darwaza to Manek Chowk. Ahmedabad was named after Ahmad Shah I of the Muzaffarid dynasty who captured Karnavati in 1411. He established Ahmedabad as the new capital of Gujarat Sultanate and built Bhadra Fort on the east bank of the Sabarmati river. Islam strictly prohibits idol worship and it is forbidden and punishable under Sharia law to worship or give a physical representation or the form of an idol, figure, figurine, animal, etc to God. Then, how these elaborate filigree carvings exist on pillars and ceilings of this construction ? The Mosque is built with yellow sandstone, and the complex is centered on a large rectangular courtyard 75 m long and 66 m wide. One enters the court by three entrances, one at the center of each side. The prayer room is also rectangular and covered by four domes. In its Indo-Saracenic architecture, the mosque also contains many syncretic elements not necessarily obvious to the viewer: some of the central domes are carved like lotus flowers, closely related to the typical domes of Jain temples; and some of the pillars are carved with the form of a bell hanging on a chain, in reference to the bells that often hang in Hindu temples. The wide open courtyard, floored with white marble, is ringed by a colonnade painted with giant Arabic calligraphy, and has a tank for ritual ablutions in the center. 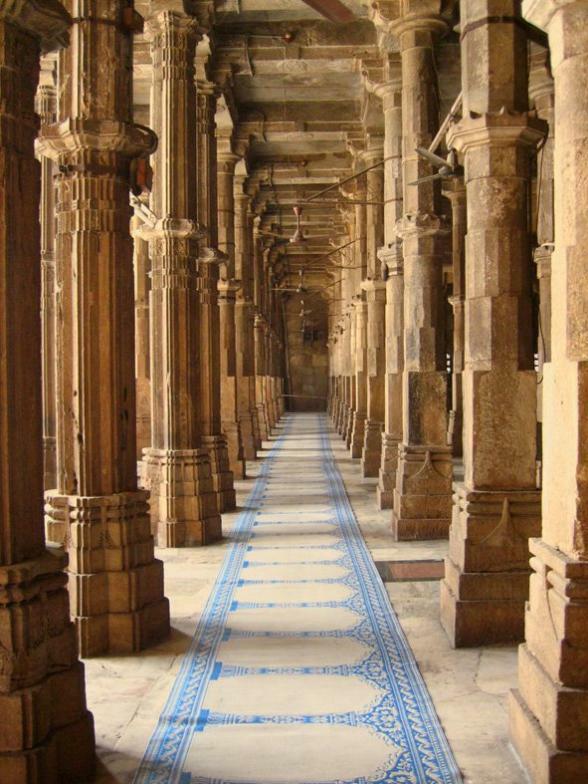 The mosque and arcades are built of beautiful yellow sandstone and carved with the intricate detail that mosques of this period are known for. While the two principal minarets flanking the main arched entranceway collapsed in the 1819 earthquake, their lower portions still stand. The main prayer hall has over 260 columns supporting the roof, with its 15 domes, making a walk through the hall a beautiful maze of light and shadows. The Wall of Prayer, the qibla is decorated. Pierced stone screens (the ‘Jalis‘) are placed between the two pillars of the central openings. The main entrance is framed by two columns, the remains of two minarets (the ‘shaking minarets‘) which were destroyed by the earthquakes of 1819 and 1957.